Al Kelly, owner of Kelly’s Sports Ltd. Nominated by his fellow member of the West Chester VFW William Ferrier for the years of service he and his late wife gave to the community, which include the construction of a ball field and a Government Service Building on Westtown Road, the creation of a scholarship fund for students in need, service to local schools and colleges as well as the donation of tables and grills to Post 106 of the VFW. What drew you to Chester County and how did it come to be your home? Well I went to high school here … I went to grade school here, and that's how I got to Chester County. Describe your occupation. Do you work for a large company or a small one? Are you self employed? Do you work for a non-profit? Well I started in 1957. I got out of the military after four years in 1954. 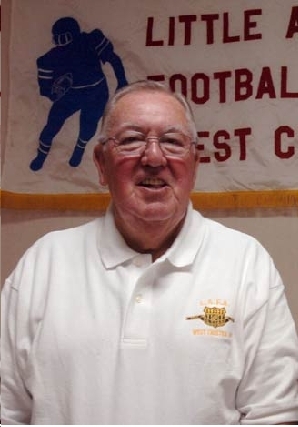 I played three years inside pro-football and then I started a youth football program in 1957 which this past weekend celebrated 50 years of continued service to the youth of our county. That's the start of it. My sixth grade teacher was my main influence. She had us play tackle football with the helmets and pads and everything on the play grounds. That brought me back home to help the kids get started with planning the youth football program and that's where we are today. I also built a couple of softball fields. Green Field in 1958 where they play adult softball and that's where our football field started. We extended the fields and put a football field inside of the softball diamond area. About 40 by 88 yards is what we could come up with and we're still playing on that size field. We have 550 kids, at least, playing football out of the Chester County area this year on our field. Another community effort that we built was a big ballpark out of a government service building and we have little league baseball, two adult softball fields, soccer for youth and adults and a football field which is occupied by youth lacrosse and youth football. I helped the West Chester Community Center about 10 years back. I put a basketball court in there, backboards and benefited the summer programs for the community center. Every year we got something going on. We help with the college in refurbishing the history of the college athletics. That took up quite a few years. My employment was right out of the military I worked for Burought Corporation in Paoli for eighteen years in electronics and that's what people don't know about me is that I was in that type of business and I worked at Cape Canaveral. We had our first space shuttle launch from there and I went from a guy who was involved in stuff like into being with my store for 37 years now. I started it in 1973 and we're still going strong with that. With the business now, it gave me a chance to get out and do what I want to do now. Someone in Chester County has decided to build a statue in your honor. Perhaps it's for all the dedication you've shown to a particular organization. Or perhaps it's to commemorate a significant milestone in your life. Tell us who built it and why, and where would it be placed. I would think for my wife because when you're married to a woman like that that can help you and give you everything you're interested in. She likes me doing the sports, she liked me taking my trips out west where I go hunting and fishing and she supported me. We were married 52 years before she passed away and we had a good life. If you could spend one worry-free Saturday afternoon in Chester County, where would it be, and who would it be with? Well, I got so many friends. Awhile back I was having lunch with eight classmates from back in the early 50's and we meet every month at the Courtyard Inn and we have lunch and we talk and preview all the football programs and the yearbooks and see how many people we can remember out of the books and that's pretty neat. But where would I like to be in Chester County? I would say West Chester. I was born and raised here and I've seen everything here. I've seen all the historical buildings that were in West Chester torn down like the President Bus Station, the train station the firehouse and stuff like that. There are a lot of memories here and no matter where I go in Chester County, I can go from one end to the other and people in the restaurants are better to know who I am and say ‘hello' and shake hands. It's a great feeling when you have people like that who remember you. Describe your quirkiest/ oddest/ most unique behavior or personality trait. I don't talk about myself normally because I like having friends, I like helping them do things and if they need something I like to try and make sure I can find it and give it to them and help them out. I delivered an American flag to West Chester University for their football homecoming. I seen a little tear in the one last week so I replaced that flag for them. It made me feel really good to get over there and give it to them. Fill in the blank: More than anything, Chester County needs _______________. I would say transportation and healthcare and some places that I would like where somebody could go and get some free help with maybe healthcare. I mean a lot of people go around with ills and when they finally have to go to the hospital it's too late.